Friday 22 December. My Christmas shopping day. I wondered how old I'd been the first time I'd bought my family presents. I had no memory of it. During my twenties, I used to do stupid things like buying large gifts even though I had to travel. Then I'd end up filling some bin sacks and would barely be able to carry it all. There was no danger of that this year. In fact I was going to get everything I needed without leaving East Dulwich. The fastest, lightest, most convenient Christmas shopping trip ever. This would be even quicker than ordering goods online. I'd considered heading to Oxford Street or Westfield but Lordship Lane had everything I needed. Dad was the easiest as usual. Everyone knew what Jon Copping liked so his was in the bag first. A couple of gift cards made their way onto my list this year. A tad unimaginative but I'd received some in the past, plus Pizza Express had practically become a household tradition. The first few people had been straightforward. East Dulwich High Street had no public benches but someone had left a large broken TV by the kerb side just off the main road, so I perched atop it to eat my sandwiches. I'd wanted to purchase a particular type of book but the only bookshop on the High Street hadn't got it in stock. The line coming out of the cheese shop across the street caught my eye. It was like the whole town had turned into mice. I walked up the rest of the High Street, almost aimlessly. What was I going to do about that book? 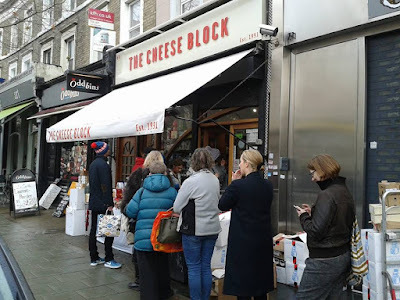 I walked past the chemist, a couple of restaurants and another cheesemonger, complete with queue stretching along the pavement. I could just get some cheese. But then what type? I had no idea. Eventually I remembered that there was another bookshop. A small one, nearer the park. I hot-footed it down there and was pleased to find a suitable tome. As I approached the checkout, I heard the manager telling his assistant to fetch him a sandwich... or a croisant... either, so long as it had cheese in it. Streuth. The entire population had gone cheese crazy. I hadn't got cheese for anyone. Had I completely failed the task? Would I turn up and watch my family exchanging Roquefort, Munster and Stilton, while I looked on, embarrassed? I texted my sister to ask what she'd got people. She told me a few items. Great. None of them were cheese. I decided to head home and start wrapping. I would sleep soundly tonight. Possibly dreaming of a yellow Christmas. Haha, a town of mice:)...... is cheese really that popular? I’m guessing cheese is a man present, whereas biscuits are for the females. I prefer Fizz myself but have already had a tin of biccies as my secret Santa gift. Definitely a sign I’m getting old! I had rude desk signs last year which I loved, but they didn’t have any stands to display them on?! Anyway, glad you didn’t have to substitute your book idea for cheese and hope your dreams of Christmas aren’t all yellow. (It’s one of my least favourite colours) It just doesn’t go with anything. Just some final decorations to put up and I shall be resting til the big day. Yes, Lordship Lane has two cheese shops and they were both the busiest places on the High Street, with queues spilling onto the street. How are biscuits a sign of getting old? Interesting that you don't like the colour yellow. It's a happy colour. What about orange? Ok so Christmas Eve is a day or rest for you. I'd better get on with the wrapping. I associate biscuits with presents for old people because my Nan liked biscuits, and my Mum has always moaned about people buying her biscuits for Christmas saying “Guess that’s what you get when you’re old”. Yeah I think yellows a funny colour. It’s just too bright and acidic and jars with everything. I do love orange though and even the odd smattering of red. I’m always drawn to the purple spectrum. Aubergine to Cerise pink. White and creams too. Any colour likes or dislikes?